Along with all other ‘Pools supporters I was greatly saddened to learn of the death of Ken Johnson shortly after Christmas. He was part of my introduction to Hartlepools United, as we were when he played for us, and he was part of a wonderful team that almost achieved promotion to the old second division. When I was a kid living on the central, I often used to see Ken striding by on his way to call on his girl-friend (later wife). I was awe struck. Here was one of the gods who played in blue and white walking down the same street as me. I couldn’t think of a reason to speak to him or summon the nerve to approach him for an autograph (but from what I’ve heard of the man I’m sure he would have obliged) so I just stared at him until he went out of sight. I never did get to meet him and that will now always be a cause of regret. I’m not going to regurgitate all the statistics about his time with ‘Pools as they are all freely available in various publications and web sites and truth be told I would have to look them up to be sure of the facts and figures. There is just one statistic that always sticks out for me and that is that in the calendar month of September 1956 he scored 12 league goals. I don’t remember being overly impressed at the time (after all that’s what Hartlepool centre forwards did, didn’t they) but in retrospect it was obviously a magnificent achievement. "I never did get to meet him and that will now always be a cause of regret." When you look at his goal scoring record it always seems surprising that he did not play in a higher division than the third division (north) and fourth. I don’t know if he had any offers but it would be a major surprise if no interest was shown by higher placed clubs. However when he was in his prime the maximum wage was in operation (some clubs even followed the rule) and why would he have left his home town team to play for someone else just for a £10.00 signing on fee? So he played for his home town club for 15 years and in that time the club got the best of the bargain. As I remember him Ken was not the ‘old fashioned burst through a brick wall’ kind of centre forward like Bob Newton (why trample over the centre half when you could lose him with a feint and a turn) but he was up for the physical challenge when that was needed. Towards the end of his career with ‘Pools Ken switched to being a wing-half, which probably explains the fall off in his goals output. I can even remember him finishing one game as goalkeeper when the regular keeper had to go off injured (no substitutes in those days). I can clearly remember as the keeper was being taken away they stripped his jersey off and Watty Moore signalled to Ken, in an unambiguous gesture, that he was to take the goalies place. Uncomplainingly Ken went between the sticks. At this point my memory fails me as I can’t remember the outcome of the match or whether he managed to keep a clean sheet for the rest of the game. So, record holding goal scorer, a willing wing half when the club needed one, temporary goalkeeper in an emergency; and added to all that, considered to be an all round decent man by all those who came into contact with him. 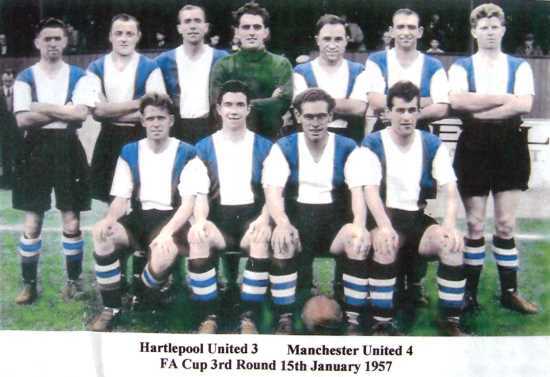 Ken Johnson fully deserves his place in Hartlepool United’s hall of fame. I’m so glad I had the chance to watch him in action.